In the first two columns in this mini series on harmonics we explored ways to apply natural harmonics and then mapped out the available pitches. (Part 1 / Part 2) In this third installment we will investigate artificial harmonics. If you remember the brief physics lesson in part one, I described how the string vibrates at several different high frequencies simultaneously to the fundamental frequency of the pitch, and playing a harmonic isolates one of these frequencies, depending on which node point along the string it is stopped at. Artificial harmonics work in exactly the same way, but for fretted notes. Harmonics can be set up on any length of string and the node points remain in the same proportions. To be clear, the natural harmonic at the 12th fret divides the string in half, the 7th fret divides into thirds, and the 5th fret into quarters. Therefore, harmonics can be found 12 frets above any fretted note. Thankfully this is nice and simple because it will be in the same fret of the higher octave of the guitar as where you’re playing in the lower half. In theory it is possible to achieve all the harmonics that we looked at getting out of an open string last week, but in reality players usually limit themselves to the harmonics of an octave and octave and a fifth (12th fret and 7th fret) as now we have two hands to keep control of on the fretboard. I will limit the exercises to the just octave harmonics for the purpose of clarity and accessibility. Artificial harmonics are only different from a technique perspective. Given that the three jobs of fretting the string, stopping the string at the harmonic node point and picking it must all be done simultaneously, a new technique must be applied to facilitate them. 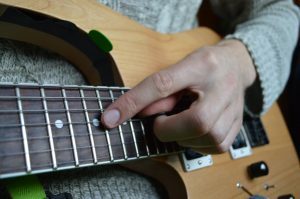 The fret hand will play as normal, but the picking hand will cover the job of both stopping the string at the node for artificial harmonic and picking it. The most widely used approach is to hold the pick with the middle finger and thumb and then extend the first finger. The motion is to ‘point’ at the fret wire twelve frets above your fretted note and while gently touching the string (not holding it down to the fret) pluck the string with the pick. You may find it helps to anchor yourself with the little finger to the body or the side of the neck at first. Some players use the classical technique and dispose of the pick completely and use the thumb alone to pluck the string. Here is a picture of my picking hand position for performing artificial harmonics. Our first example uses artificial harmonics to decorate a series of common open chords. I would advise focusing on the picking hand’s role as the chords should be fairly familiar. For this style of playing everything should ring out as much as possible so be careful to not mute accidentally with your hand over the fretboard. A good exercise for developing accuracy for hitting the harmonics is to practice scales and patterns. Here we ascend an A major scale and then descend through an A major 7 arpeggio. The fretting hand’s job should be second nature so you can concentrate on tracing the pattern with the other hand. Finally we combine artificial harmonics with normal notes. You will probably need to put the pick down for this one. I use the third or fourth finger of the picking hand to pluck the high strings, while the thumb and first finger handle the harmonics. Recommended Listening: Chet Atkins’ virtuosic use of harmonics in the middle section of his track ‘Chinatown, My Chinatown‘, ‘Long Lost’ from Steve Morse’s ‘Coast to Coast’ album, and Steve Hackett’s classical guitar piece Horizons are all great examples of artificial harmonics in use.